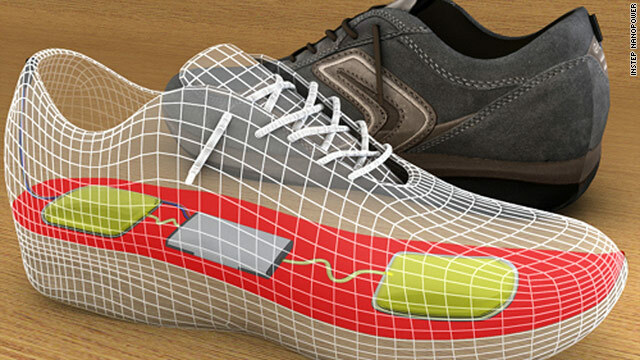 An "energy harvester" in a user's shoe could convert energy from walking into power for cell phones, researchers say. (CNN) -- Will you be able to charge your next mobile phone simply by walking around? "Humans, generally speaking, are very powerful energy-producing machines," Tom Krupenkin, a UW-Madison professor of mechanical engineering, said in a news release from the school. "While sprinting, a person can produce as much as a kilowatt of power." Under the system, an "energy harvester" that would be installed in a person's shoe would capture some of the mechanical energy that typically burns away as heat and convert it to up to 20 watts of electrical power for a personal device. The harvester would act as an intermediate transceiver, or Wi-Fi hot spot, to serve as a "middle man" between a mobile device and a wireless network, thereby reducing the amount of energy the phone needs to send and receive signals. Researchers call the process "reverse electrowetting," transferring the energy via nano-tubes containing thousands of liquid "micro-droplets." The researchers say making their technology widely available would have a positive environmental impact, reducing society's need for batteries and the pollution that ensues when they are disposed of improperly. Krupenkin said "reverse electrowetting" would conserve enough energy to make a typical cell phone battery last 10 times longer. "You cut the power requirements of your cell phone dramatically by doing this," he said. The technology was developed with a grant from the National Science Foundation. Now Krupenkin and Taylor hope to make some money with it through a company they've created, InStep NanoPower.